Why do you love dogs? Can you tell me several reasons why dog is your best friend? I think it will be easy for you! First of all, dogs have unconditional love for you! They are great listeners. ‘’They never talk about themselves but listen to you when you talk about yourself and keep up an appearance of being interested in the conversation.’’ - Jerome K. Jerome. They look right at you with a look of concern when you tell them about your rotten day. Dogs are fun. They will not ever allow you to be depressed or bored. Dogs are always happy to see you. You can read their thoughts in the eyes: “You are back! I missed you so much!” They are very smart and easy-trained creatures. There is no doubt that every dog is miracle with paws! Do you agree? Be ready for attention! 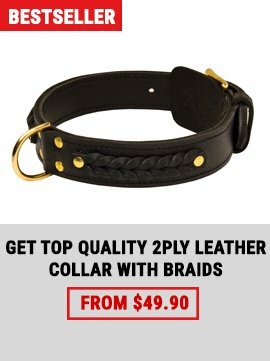 Your dog will look awesome with this exclusive dog collar on! 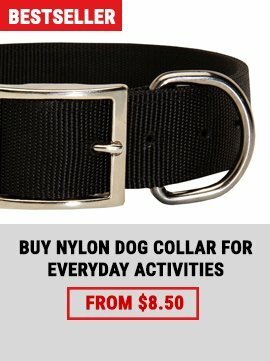 This collar may be recommended for any pet of any size and perhaps will coincide any taste. 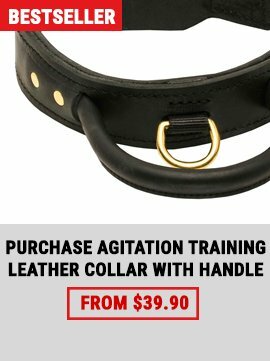 Classical leather collar looks a bit formal but at the same time it does not detract attention from your dog but only accentuate his inborn nobeleness. 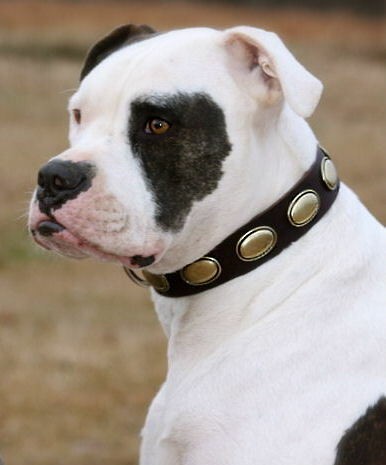 Sun shining studs turn this collar into a stylish decorative dog accessory. The collar is 1 inch (25 mm) wide so it looks like an elegant slim accessory on the dog’s neck. However, this collar is a functional tool that perfectly copes with everyday duty.